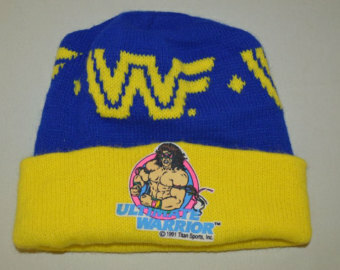 Someone Bought This: Hulk Hogan and Ultimate Warrior knit caps - WrestleCrap - The Very Worst of Pro Wrestling! Personally, I’d rather not wear one of these ugly, garish knit caps in the winter and risk getting pneumonia in our -10 degree Midwestern winters instead. Really… You might as well just put a sign around your neck that says “Please pelt me with icy snowballs mercilessly until I wet ’em and run away crying”. 14 Responses to "Someone Bought This: Hulk Hogan and Ultimate Warrior knit caps"
How about a Barbarian cap with antlers? I’d buy one of those! Honestly, I’d still wear the Warrior one, cool stuff! If they made a black and purple Undertaker one of these? I’d buy 21 on them. I wish I still had my Warrior one. 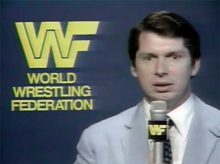 Compared to most fashion of the 90’s, these are the least horrible WWF items to come out of the era. 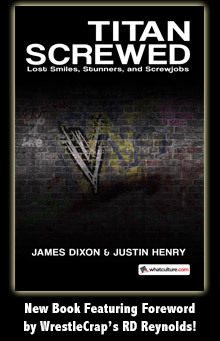 I think they are down right awesome. I can picture some hipster in Williamsburgh going on eBay right now. Retro baby! I read this as Hulk Hogan and Ultimate Warrior knit caps, as in them physically knitting caps. Would have loved to see their techniques compared to one another. Then I realized this was a Someone Bought This and not an It Came From YouTube. That would have been SO MUCH BETTER!!! 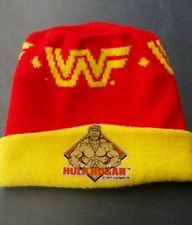 The Ultimate Warrior cap should have came with a couple of knit scarves that you could tie around your biceps outside of a winter coat. Somewhere there is a picture of me with Brutus the Barber Beefcake (who was doing an autograph signing in a hardware store for some reason); I’m wearing that Hulk Hogan hat, Hulk Hogan gloves and a Hulk Hogan winter coat. I refused to take them off for the picture.